Everyone grew up with a version of this classic comfort food. I have had a love affair with Macaroni & Cheese since I was a child. Who hasn’t? Pasta wrapped in a creamy, comforting, cheesy sauce. How could you go wrong? If you have never made homemade Mac & Cheese, except for the blue box with the day glow orange “cheese,” I think you need to change that. 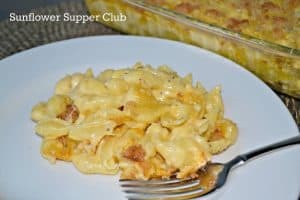 This is my family’s favorite version of this classic dish, my Nanny’s famous Macaroni and Cheese. If you’re on a really tight timeline, you could serve it after you combine the pasta and the cheese sauce in the saucepan. I prefer it after it bakes and the cheese on top gets a golden crust. Not to mention the toasted bread crumbs, which are nice contrast to the creaminess of the sauce. Keeping with my New Year’s resolution of eating fewer processed foods, I made this last week. I know, I know, it is not low fat, but it is made with wholesome ingredients that I can pronounce! Don’t tell my kids, but I used whole wheat pasta and bread crumbs on the top. We are taking baby steps. Shhhh…..
4 cups (16 ounces) Cheese, We like to use ½ Sharp Cheddar and ½ Colby/Jack. Bring a large pot of salted water to a boil and cook your pasta until it is al dente. Meanwhile, melt 6 tablespoons butter in a large saucepan or dutch oven. When the butter is melted add the flour and whisk until bubbly, about 2 minutes. Add the garlic and continue cooking for a minute until fragrant. Slowly add the milk and bring to a boil. Reduce the heat and let simmer a few minutes until thickened. Remove from heat and add the Dijon mustard, hot sauce, salt & pepper. 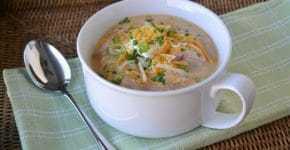 Add the cheese a handful at a time and continue stirring until cheese is melted and sauce is creamy. Transfer the macaroni to a 9 x 13 inch dish that has been sprayed with cooking spray. In a small bowl combine your breadcrumbs, Parmesan cheese and melted butter. Sprinkle evenly over the top of the macaroni. Bake at 375 degrees for about 35 minutes or until bubbly and top is browned. Cook's Note: Don't let the Frank's Hot Sauce or the Dijon Mustard scare you. They give the cheese sauce a nice flavor that is not spicy. Thanks Elpiniki! Just checked out your blog and what I’ve seen so far looks delicious! I’m now a happy follower of you! Have a great day! Wow! This looks great. I love mac and cheese and so does my whole family. Thanks for sharing on Foodie Friends Friday! Don’t forget to come back and vote on Sunday!